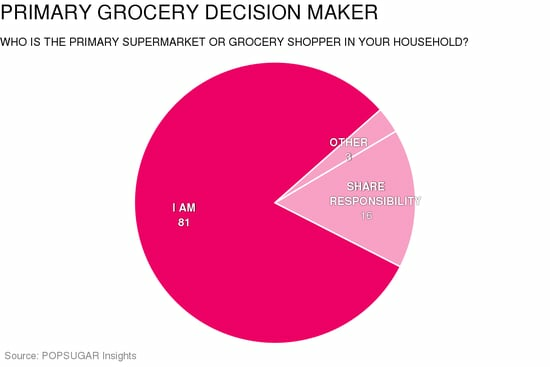 Are you the primary decision maker when it comes to what groceries to purchase or do you share the responsibility with anyone else? As part of the 2015 POPSUGAR Insights Food study, we surveyed visitors to POPSUGAR to explore their grocery-shopping behaviors. Overall, we found that 97% of women play an active role in making decisions about which groceries to purchase for their household. Eighty-one percent of women said that they were the primary decision maker, with 16% of women saying that they play a role in the decision-making process but share responsibility with a spouse or strategic other. Only 3% of women said that they have no role in the grocery-decision-making process.